Robotization of production is one of the main solutions to lower manufacturing costs and keep Europe’s production competitive. However, the use of robotic systems in industrial applications is often limited due to the fact that they are labour intensive, expensive and unsophisticated. 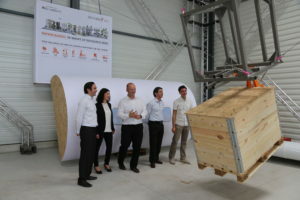 Innovation: EARTO member Tecnalia has developed CABLECRANE, a fully automated handling system based on a cable driven robot mounted on a smart crane. Thanks to this novel technology it is possible to fully control very heavy parts, handling and placing them with high accuracy. The CABLECRANE system has a wide range of applications, such as naval construction, civil engineering, aeronautics or nuclear industry. Impact Expected: CABLECRANE ensures handling and assembly time reduction by 50% for an increased productivity of 50% as well. Investment costs are reduced by 20% and work accidents by 50%. The European market for production of cranes and related lifting equipment is worth €9.000 million per year. The CABLECRANE solution can cover 5% of this market which represents a potential market of €450 million per year. The commercialization of the solution is expected at the end of 2016.